The SprayFast Microblower is ideal for dry rot and woodworm treatment using water based products, such as our Boron Ultra 12. It saves over 50% in spraying labour time and allows access to hidden voids. Microsprayers can be hired for spraying woodworm and dry rot, under floors, in roofs, through air bricks and behind panels. The PRS Sprayfast Microblower is a machine for applying water based fungicidal and insecticidal treatments to under floor spaces and behind panel areas, as well as within roof voids. It allows spray treatment to all kinds of masonry and timber, even where direct access is not available. 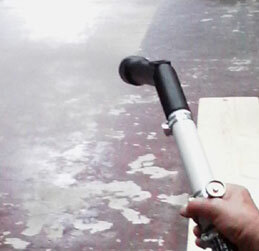 It can treat floors via air brick holes and spray up to 10 metres. Why not Atomize, Fog or Mist? 1. The pesticides are not designed to be used in this way, so the resulting concentration of active ingredient in the resulting fog is too low to be effective and will not meet the Manufacturer's specification. 2. Fogs and mists are prone to drift around on the slightest breeze, entering other rooms, escaping into the open air and affecting non protected people and animals. 3. Atomized treatments cannot be guaranteed because the surface loadings of active ingredient fall below the recommended levels. 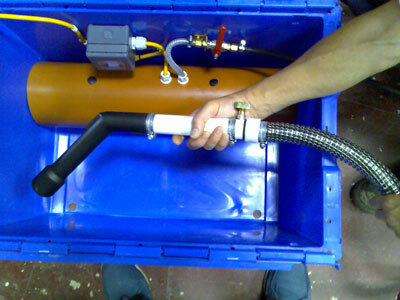 The Blower and all its pipework, hose and cable fit inside a standard tough plastic box for easy transport. 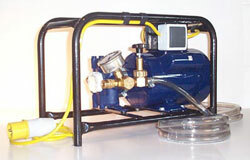 The machine is operated from the box with the lids closed to keep the pump clean. 3. Fluid input hose - 1/4 inch I.D. 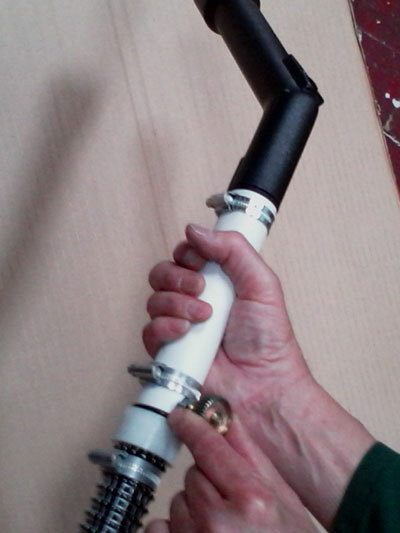 heavy duty flexible hose, 5 metres long, fitted with a snap-on tail which plugs into standard Eclipse, Sovereign and Birchwood pumps and can be extended further using standard fittings. 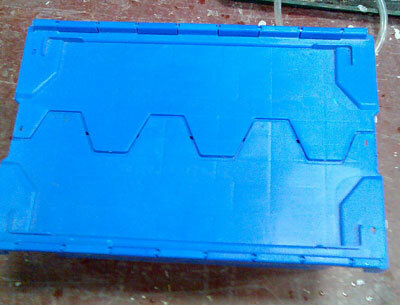 SprayFast Microblower inside its tough plastic crate. The Sprayfast Microblower replaces the atomizing, fogging and micro spraying machines widely used in the Remedial and Pest Control industries. (These are not suitable for Pesticide application in Remedial Treatments because they were designed for very small localised ULV (Ultra Low Volume) treatment. The Sprayfast Microsprayer can blow a moving turbulent cloud of air carrying COARSE droplets of treatment fluid up to 10 metres in still air and is therefore ideal for sub floor voids, roof spaces, behind paneling and for general purpose spraying. Damp proofing and timber preservation specialists generally use a high pressure electrical pump to spray timbers with timber preservatives and to inject damp proof courses . These twin piston, self priming pumps are used with a range of accessories, including injection rods (DPC Injection, 10mm diameter holes) and spray lances (Timber Preservation and Dry Rot masonry treatment). 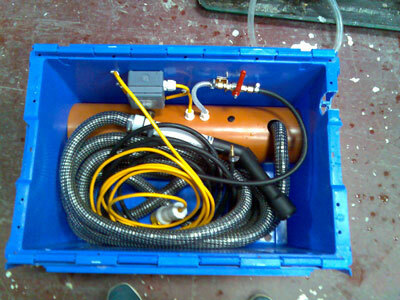 Typical Spraying and Injection Pump for high and low pressure injection of damp proof courses. The spare parts for maintenance and repair of DPC and Spraying pumps are available ex stock for pumps up to 25 years old - these pumps last a long time with the right care. 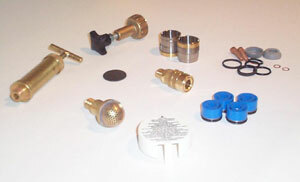 High quality brass spray lances and extension tubes, adjustable spray nozzles and backspray nozzles are required for treating woodworm and dry rot. The 'backspray' allows injection of spray into hidden spaces behind panels (like staircases) and the flight hole nozzle can be used to inject individual holes.